UK orders are holding in positive territory, but not by much. Order volumes expected in 3-Mos snapped back in January. Prices are staying very strong in the range in the top seven percent since end 2000. Export orders did tick back down in January to -4 juts below their 12-month average at -3. 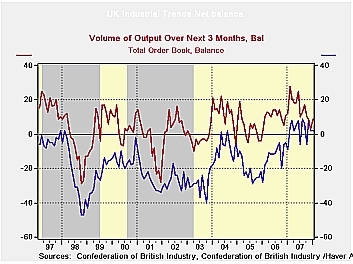 On balance the UK industrial sector looks fairly firm and somewhat inflation prone.